Glaucoma is a chronic progressive eye disease characterized by a degeneration of the optic nerve. This can lead to serious vision loss if not detected and treated early. The optic nerve takes all of the information the eye sees and transmits that information to the brain. Glaucoma is one of the leading causes of blindness in Canada. The exact cause and mechanism of glaucoma is not fully understood. There seems to be some level of mechanical compression and/or decreased blood flow to the optic nerve. Although high pressure inside the eye is associated with glaucoma, some people can also develop glaucoma with “normal” eye pressure. An injury, infection or tumour in or around the eye can cause the pressure inside the eye to rise, leading to a form of glaucoma. These situations are referred to as secondary glaucoma, because their cause is a result of another condition. There are two types of adult glaucoma which are not due to these other causes. Primary open angle glaucoma is the most common type and results in slow loss of vision with no symptoms. Acute angle-closure glaucoma is less common and results in a sudden elevation of pressure and symptoms of pain, redness and nausea. Glaucoma most frequently occurs in individuals over the age of 40, and there is a hereditary tendency for the development of the disease in some families. There is also a greater risk of developing glaucoma when you have diabetes, high blood pressure or a history of an eye injury. Regular eye examinations at Kniaziew Optometry are important for people of all ages to assess the presence of, or your risk for, glaucoma. Glaucoma cannot be detected without an eye exam. The optic nerve, located at the back of the eye, carries visual information to the brain. When the fibres that make up the optic nerve are damaged due to increased pressure and/or reduced blood flow to the nerve, the amount and quality of information sent to the brain decreases and a loss of vision occurs. Usually peripheral vision is affected first, followed by central vision during the later stages of the disease. Glaucoma is sometimes called a “silent disease” as it usually does not cause symptoms and the loss of vision is not noticed by the patient until the loss is quite advanced. If diagnosed at an early stage, eye drops and laser treatment can control glaucoma and little or no further vision loss should occur. Note that if eye drops are prescribed, they have to be uased always to control the eye pressure. If left untreated, peripheral vision is affected first, followed by central vision loss during late stages of the disease. Complete blindness can occur. Primary Open Angle Glaucoma (Chronic Glaucoma), which is the most common type of glaucoma, develops painlessly and gradually. There are no early warning signs and it can gradually destroy your vision without you knowing it. Regular eye exams are the only way to assess glaucoma risk and detect the presence of this form of the disease. A comprehensive eye examination is the first step to detecting glaucoma. 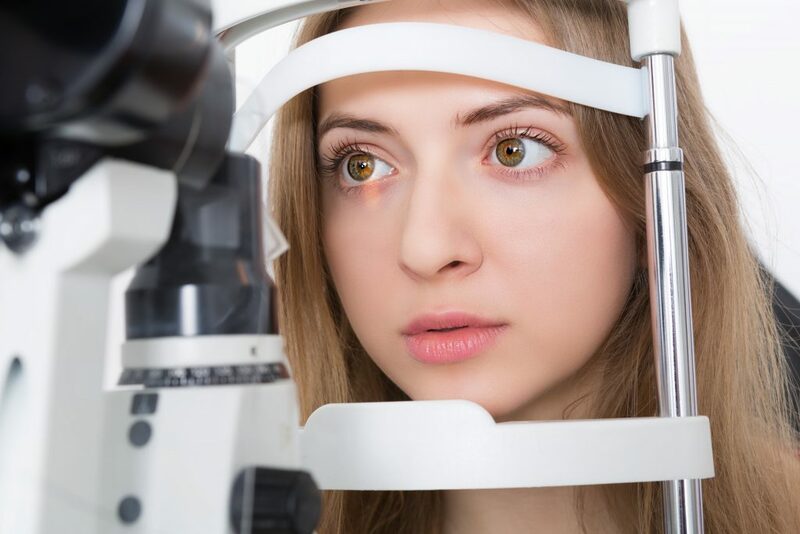 A Kniaziew Optometry doctor will perform a simple and painless procedure called tonometry during your routine eye exam, which measures the internal pressure of your eye. He/she will also inspect the drainage angle inside the eye and look into our eye to observe the health of the optic nerve and measure your peripheral vision. The optometrist will often take a detailed look at your optic nerve through a dilated pupil using a series of hand-held lenses. They may also use advanced imaging devices when assessing your optic nerve. Treatment of glaucoma will depend on the type, severity and progress of the disease. It cannot be cured, but it can be controlled, often with daily eye drops. Laser surgery is also an effective way to control glaucoma and maintain your remaining vision. Primary Open Angle Glaucoma, also called Chronic Glaucoma, is the most common type. It can also be difficult to detect since it advances slowly. An open angle chamber inside the eye causes intraocular pressure to increase. Chronic Glaucoma is caused when the drainage channels inside the eye gradually clog preventing normal draining from occurring. This builds pressure inside the eye and gradually damages the optic nerve. The cornea, sclera (the white part of the eye) and the iris are also affected by growing pressure. This condition, also called Closed Angle Glaucoma, occurs when the angle of the chamber narrows. This also prevents normal drainage of intraocular fluid. Acute Glaucoma occurs suddenly with symptoms such as severe eye pain, blurred vision, headache, profuse tear production and halos in the field of vision. If you are experiencing any of these symptoms, you should request urgent glaucoma testing at our clinic. Acute Glaucoma is most common in people of Asian decent. Farsightedness also contributes to a person’s risk of Acute Glaucoma. Age is another factor that increases a person’s chance of experiencing this condition because the eye’s lens begins to naturally enlarge, resulting in a narrowed angle. Sometimes a patient may show evidence of damage to the optic nerve even though the pressure inside of the eye is within normal range. Normal Tension Glaucoma is tested through examination with an ophthalmoscope. By using the ophthalmoscope to look through the pupil, our Optometrists can see the colour and shape of the optic nerve. A visual field test can be used to detect blind spots even when a patient is not aware of having any. Risk factors associated with this condition include genetics, systemic heart disease and Japanese ancestry. This rare condition occurs when an infant’s eyes drainage canals do not experience full development during the prenatal period. Excessive training, sensitivity to light, enlarged eyes and cloudy eyes are indications of Pediatric Glaucoma. Parents should seek testing for their infant if these signs are detected.